Growing up on the plains of Canada in heart of wheat country, my grandmother learned to bake with staples like wheat flour, butter, sugar and eggs. 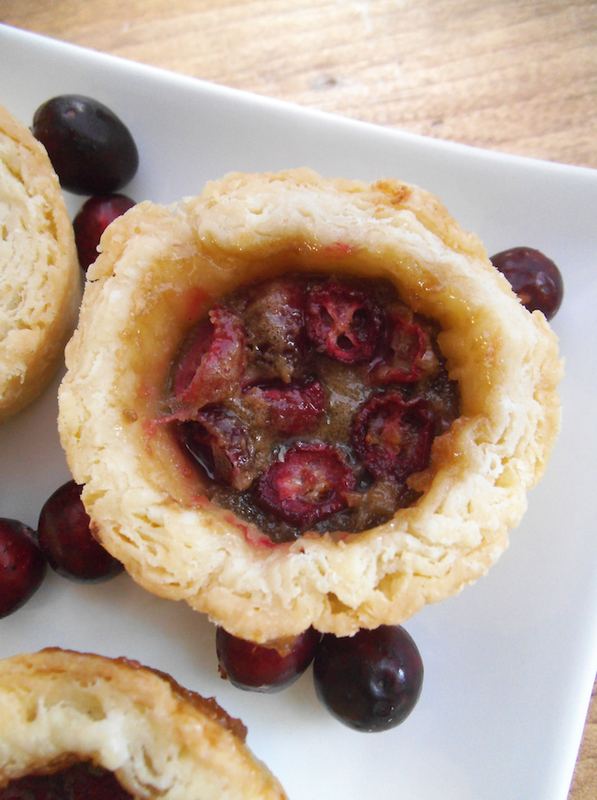 With those simple ingredients she proved it is possible to create quite an array of baked goods, including butter tarts. Her recipe was one of the only butter tart versions I have come across that leaves out syrup of any kind (usually they call for corn syrup or maple syrup). My grandma was sparing with her instructions, but I found that when she was specific, it was important for getting good results. With this recipe I had to make sure I followed her technique of chilling the filling before adding it to the tart shells. Also important was using just one tablespoon of filling per tart; when I added too much, the filling rose up and overflowed during baking. Again I was reminded that heeding her advice is almost always the best route to take–and not just with baking. Although I wish I could have seen exactly how she made her tarts, I am exceedingly thankful that I have a number of her recipes preserved in two cookbooks–one put together by my aunt and another by her church. Each time I read a recipe of hers or make something that she made, I miss my grandma. And as I recall her kind countenance and contentment in the kitchen, I am challenged and inspired. To make the crust for the tarts, use a pastry blender or your fingers to combine the cold butter, flour, and salt, until a crumbly mixture forms. Add cold water gradually, until a dough starts to hold together. Wrap and chill dough for 10 minutes. Roll out dough on a floured surface and cut into circles to fit muffin tin cups. 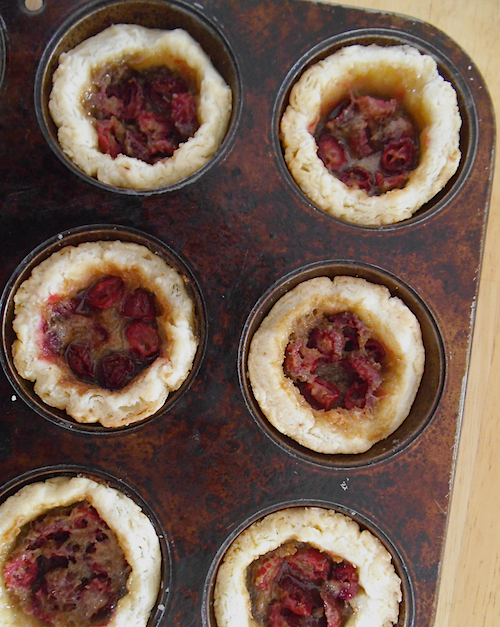 Shape the crust into the muffin tin cups and place the prepared crusts in the freezer or refrigerator. To make the filling, beat eggs with a fork or whisk. Add in brown sugar and butter and blend with a fork or whisk until smooth. Refrigerate the filling for 15 to 20 minutes. Preheat oven to 375 degrees F (190 C). 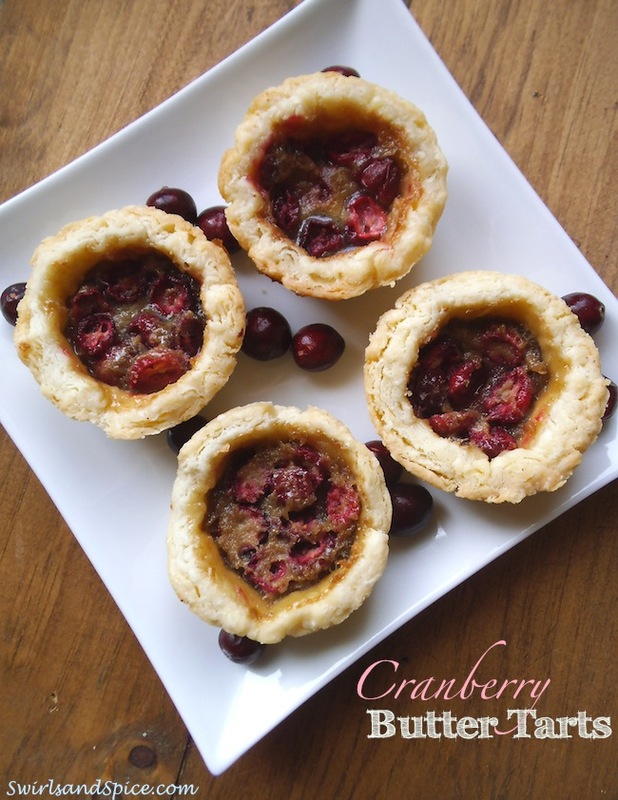 Take the chilled crusts and fill each one with a layer of cut cranberries. Then add one tablespoon of the filling mixture to each tart shell. 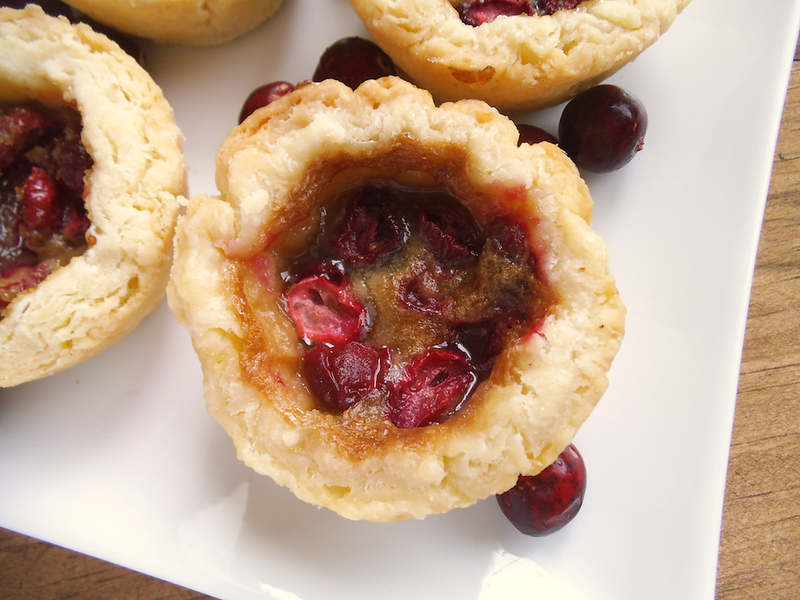 Bake tarts for 12 to 15 minutes, until crusts and filling are golden. The filling expands during baking and will sink somewhat after cooling. Serve tarts at room temperature. Tarts freeze well. Thaw completely prior to serving. I share recipes and find inspiration here. Mmm…I was just thinking to myself earlier today how it’s about time to start looking for cranberries and cranberry recipes! How serendipitous 🙂 These tarts look beautiful, and that’s so nice that you have your grandmother’s recipes to remember her by! These are so pretty and perfect for fall! Stopping by from the Pintastic Pinterest Party and pinning to my Dessert Recipes to Try board!